Next-generation home networking environments will contain a variety of Internet-ready devices or embedded systems, which will result in increased complexity for the end user. New methods are therefore required to build autonomic networking infrastructures that enable auto-configuration and self-management of the networked elements and keep technical details hidden from the user. In future Internet-based home environments a variety of devices such as PCs, smart phones, networked appliances and embedded systems will be organized into infrastructures and will act together to form a new type of service provisioning platform. Todays typical home environments often contain a few of these Internet-ready devices; in the future there will be even more, including embedded systems like sensors and actuators that are also accessible via Internet technology (eg TCP/IP, HTTP, Web services etc). While on the one hand this gives users the freedom to access a rich variety of devices in the vicinity of their homes, on the other it increases the depth of knowledge required to understand what is happening in such a complex networking environment. Novel methods for autonomous networking as well as self-configuration, self-management, self-organization, self-protection and self-healing (self-x) of the networking elements can take responsibility for observing and controlling the home network without directly involving end users. For this purpose, the German national project Autonomous Home Networking (AutHoNe) has been started in 2007. The main goal of the project is to enable autonomous networking technologies in home and industrial environments. The project takes into account a variety of currently available or future technologies that can operate in those environments. Another aspect of AutHoNe is to provide users with a consistent and transparent view and approach to accessing information and services in the home. This includes the development of mechanisms for the intuitive definition of rules, constraints and other parameters that influence the autonomous behaviour of the networking elements. AutHoNe introduces a hierarchical concept, whereby low-level devices and communication protocols are integrated into a high-level scheme that is capable of executing so-called knowledge services to observe the entire network, and a collaborative decision-making process based on the gathered knowledge of the network. This also includes redundant behaviour of the services as well as the ability to distribute rule and profile descriptions within the network. 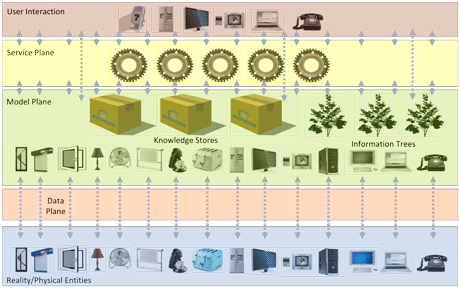 Figure 1: Hierarchical three-tiered architecture for modelling and using knowledge in a home network environment.  a service plane as top layer enabling the autonomous control of the network based on the knowledge abstraction. The knowledge model is defined through state-of-the-art description techniques (eg XML) containing basic information of the network elements as well as rule and profile descriptions and meta-information. An important requirement is that the knowledge model is available to all nodes in the network that run knowledge services in a distributed and redundant way. All the AutHoNe services operate on the modelled world. Since services have models too, they can be puzzled together in many different ways allowing service providers to mash up their services from other services. The selection of adequate protocols for the communication and model and knowledge representation is still in progress. Our model-centric design could be the key for a future home network rich in useful services that can be provided as easily as iPhone applications are today. Another important issue is the adaptation and integration of the information coming from the low-level networking elements to the knowledge model. For instance, IP-based devices can provide information about their capabilities and their state through typical network management protocols (eg Simple Network Management Protocol - SNMP). Embedded systems like sensors or actuators can provide information though other methods (eg ZigBee profiles, SensorML/TransducerML descriptions, or IEEE1451 data sheets). Ongoing work in the AutHoNe project will consider these approaches and implement suitable adaptation mechanisms in order to support current and future technology embedded in an overall knowledge-based home-networking infrastructure. The project AutHoNe is being partly funded by German Federal Ministry of Education and Research under FOKUS grant agreement no. 01BN0702. The project is being carried out as part of a CELTIC cluster with the grand agreement no. CP3-001 within the EUREKA framework.